This agreement is designed for a situation where a landlord engages a brokerage company to lease space in the landlord’s commercial properties. This particular agreement is very pro-landlord in its provisions, and specifies a deferred compensation arrangements for commissions due under the agreement whereby the second half of the commission is paid only if the tenant takes physical occupancy of the premises following its signing of the lease. RE: Proposed lease (the "Lease") between the undersigned as Landlord (hereinafter referred to as "Landlord") and Agreeable Tenant, Inc. (hereinafter referred to as "Tenant"), covering approximately _________ rentable square feet (the "Premises"), in the development known as Modern Office Complex located at _________, Town of _________, _________ County, _________ (such structure hereinafter referred to as the "Building"). 1. This letter agreement (this "Agreement") will confirm our agreement concerning the payment of a commission to Aggressive Office Brokers ("Broker") in consideration of your brokerage services heretofore rendered and to be rendered in connection with the Lease. 2. By your acceptance of this Agreement, you acknowledge and confirm to the following: (i) that Landlord shall have the sole, exclusive and absolute right to decline to entertain or to reject the terms of any proposed Lease for any reason whatsoever without incurring any liability to you, notwithstanding the extent to which negotiations may commence or continue and notwithstanding that Landlord or Tenant may be arbitrary in refusing to execute or deliver the Lease; (ii) that in the event the Lease is not fully executed within ninety (90) days from the date of this Agreement, this Agreement shall be deemed terminated, and of no further force or effect unless Landlord, in its sole discretion, elects to extend the term of this Agreement; (iii) that no other broker has been granted the right, whether exclusive or otherwise, to represent the Tenant in connection with the Lease; and (iv) that Broker is duly licensed pursuant to the real estate brokerage licensing laws of the State of _________. 3. 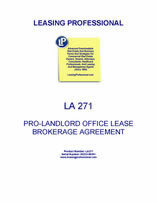 In addition, if a Lease is executed, you agree that no commission shall be due and payable if the Lease contains any conditions to its effectiveness or any rights exist on the part of the Tenant to terminate the Lease prior to the commencement of the term, until all conditions are satisfied or until the time to exercise such options has expired. Accordingly, in the event that all conditions are not satisfied or any option is exercised so that the Lease is terminated prior to the commencement of the term, then no commission or other compensation shall be payable to you. Notwithstanding the extent to which negotiations may heretofore or hereafter commence or continue, you agree that no commission or other compensation shall be payable to you if any of the conditions of the foregoing paragraph are not fulfilled for any reason whatsoever including, without limitation, Tenant's or Landlord's arbitrary refusal or inability to execute and unconditionally deliver the Lease; and in such an event you agree that you shall not have any right to and shall not assert any claim against Landlord for a commission or other compensation rendered in connection with the Lease or otherwise. 4. If a Lease is executed where pursuant to this commission agreement Broker is entitled to receive a commission in connection with the primary term of the Lease, and if the Lease contains a renewal option, then if and upon the exercise of such renewal option by Tenant (and the execution of any necessary lease or addendum), pursuant to the express provisions of the Lease affording Tenant such option, Broker shall be entitled to an additional commission, as described below, if, but only if, Broker is the only authorized broker representing Tenant with regard to such renewal and Broker is in fact active in negotiations with respect to such renewal option. Similarly, if a Lease is executed where pursuant to this commission agreement Broker is entitled to receive a commission in connection with the primary term of the Lease, and if the Lease provides for any expansion option or right of first refusal option, then if and upon the exercise of such expansion option or right of first refusal option by Tenant (and the execution of any necessary lease or addendum), pursuant to the express provisions of the Lease affording Tenant such option, Broker shall be entitled to an additional commission, as described below, if, but only if, Broker is the only authorized broker representing Tenant with regard to such expansion option or right of first refusal option and Broker is in fact active in negotiations with respect to such expansion option or right of first refusal option. 5. For purposes of this commission letter, the term "gross base rental" shall be deemed to mean the basic minimum rental to be paid by Tenant under the Lease for the use and occupancy of its Premises, minus (i) any rental waived during any designated rental abatement period (ii) any increment of rental attributable to the amortization of any tenant finish costs which are the responsibility of Tenant but are financed by or through Landlord, (iii) any charges for electrical consumption that may be imposed upon the Tenant; (iv) any escalation of such rental measured by, based on, or indexed to inflation, (v) any escalations in operating expenses to be paid by Tenant as reimbursements for costs and expenses incurred or arising out of the ownership, operation, or use of the Building, including, but not limited to costs and expenses of maintenance, taxes, cleaning, repairs, insurance, utilities, guard services, and labor with respect to the Building; (vi) any and all amounts paid by Landlord or credited by Landlord against basic rental for Tenant's moving expenses or charges; and (vii) the amount of any costs and expenses incurred or to be incurred by Landlord in connection with Landlord's assumption of, or reimbursement or other takeover obligation with respect to, Tenant's obligation under any existing lease. When you select Extended Product View in the adjacent tab, an image showing the pages of the applicable product will appear. This image shows nearly all of the text in the product except for a critical portion that has been removed for piracy protection purposes. The image also contains a watermark, which is not contained in purchased downloaded documents. This gives the user a clear picture of the content of the product prior to purchase. Purchased downloaded products contain all product text, and are delivered in word format without watermark. This lets the purchaser easily edit them to conform to the specifics of his or her contemplated transaction. Products are downloadable immediately following purchase through LP's online shopping cart, and are subject to LP's Terms of Sale.